According to the Christian Science Monitor, seven of the world's 10 countries with the most upbeat attitudes are in Latin America, says a new Gallop survey. People in 148 nations were asked: Were they well-rested, had they been treated with respect, smiled or laughed a lot, learned or did something interesting and felt feelings of enjoyment the previous day. Rediff.com brings you a list of the happiest nations in the world. The poll, released last week, shows that nations in Latin America scored well above famously happy Bhutan and accounted for seven out of the top 10 countries for positive emotions worldwide. Panama is No 1 on the list, with 85 per cent replying in a resounding YES. India stands at No 57 on this list. According to the survey, "Residents of Panama, which ranks 90th in the world with respect to GDP per capita, are among the most likely to report positive emotions. Residents of Singapore, which ranks fifth in the world in terms of GDP per capita, are the least likely to report positive emotions." 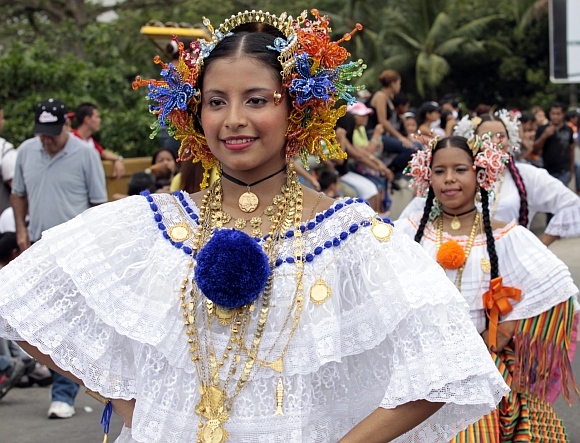 A young woman dressed in a traditional outfit takes part in celebrating the anniversary of the first call of independence from Spain in 1821 in Panama City. Paraguay ranks as the second happiest nation. 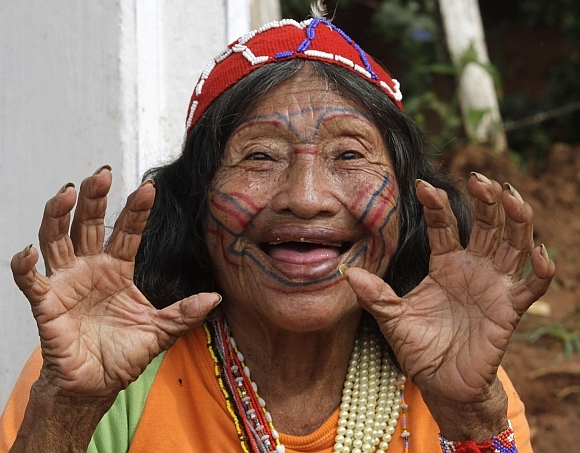 A Paraguayan Maka Indian smiles during a celebration to mark the 26th anniversary of the community's arrival in Puente Remanso, in the outskirts of Asuncion. El Salvador is No 3 on the list, with 84 per cent replying in a resounding YES. 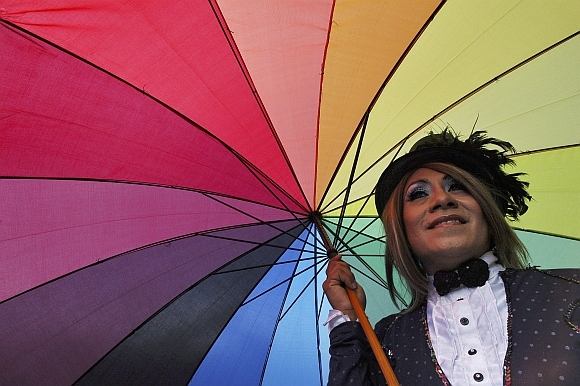 A gay-rights activist takes part in a gay pride parade in San Salvador. El Salvador is No 4 on the list, with 84 per cent replying in a YES. 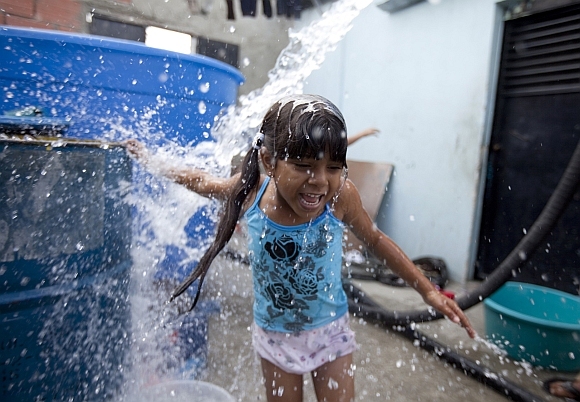 A girl plays as a water tank is filled at a neighbourhood in Caracas. Trinidad and Tobago achieves a Happy Planet Index Score of 83 of all the countries analysed. 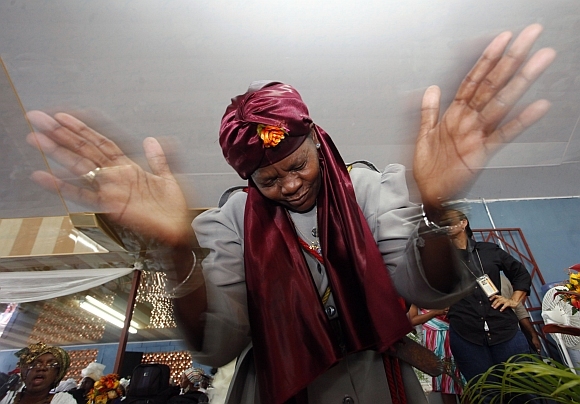 Reverend Marcia Worrell of Sons of God Apostolic Spiritual Baptist Church, from Barbados, sings at the 16th Shouter Baptist Liberation Day celebration at the Spiritual Baptist Empowerment Hall in Maloney. Thailand is No 6 on the list, with 83 per cent replying in a YES. 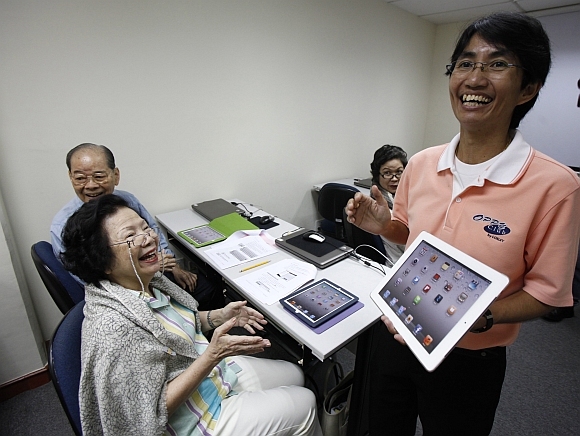 Thai couple Orasri (left), 80, and her husband, Dereck Wangwiwatana, 84, smile next to instructor Suteera Chamlongsupaluck during a basic learning course for the iPad at the Old People Playing Young IT school in Bangkok. Guatemala, a country torn by decades of civil war followed by waves of gang-driven criminality that give it one of the highest homicide rates in the world. Guatemala sits just above Iraq on the United Nations' Human Development Index, a composite of life expectancy, education and per capita income. But it ranks seventh in positive emotions. 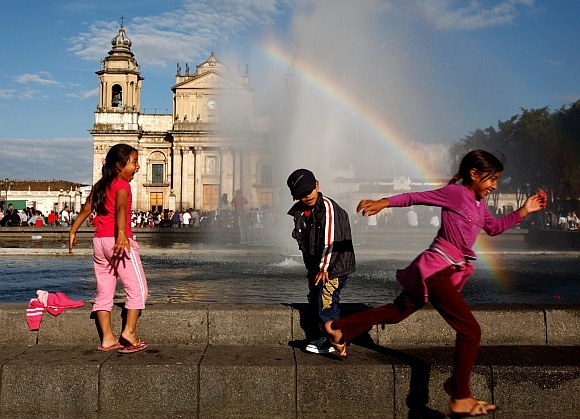 Children play near a fountain at the Parque Central in Guatemala City. Guatemalans celebrated its national Children's Day on Monday. 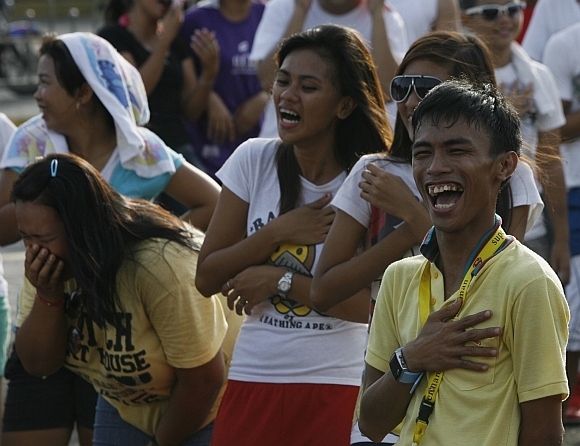 People take part in the 'Pnoy (Filipino) Laughter Yoga' event in front of a city hall in Manila. "It is a form of physical exercise that includes laughing, dancing, jumping and chanting which improves not only mobility, communication and relationships but also boosts morale. 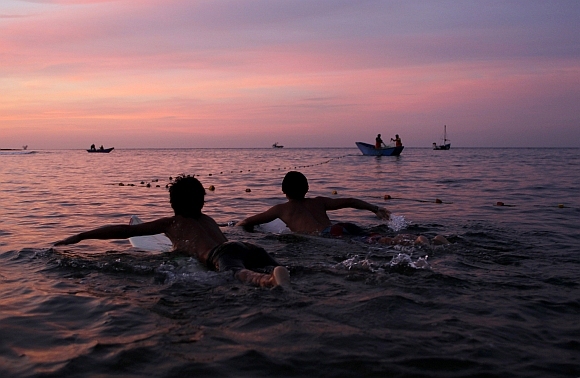 Surfers look for waves at the Punta Veleros beach in the northern city of Piura December. Northern beaches in Peru, near the border of Ecuador, are being promoted by government campaigns to encourage tourism in this part of the country. 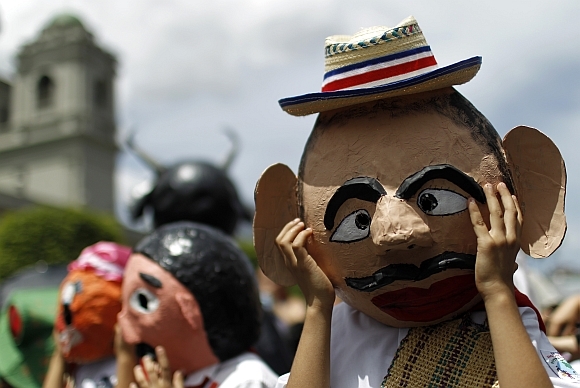 Schoolchildren wear masks representing Costa Rican farmers during Costa Rica's independence celebrations in San Jose.